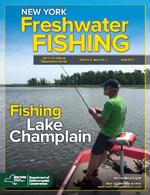 The 2017/18 New York Freshwater Fishing Regulations Guide is now available. Regulations in the guide are in effect from April 1, 2017, through March 31, 2018. Anglers should review a copy of the guide before casting a line after April 1. A summary of the fishing regulation changes that take effect on April 1, 2017, can be viewed on the DEC website. Be a fishing ambassador and take someone fishing during free fishing weekend: June 24-25, 2017. Visit our Free Fishing Days webpage for a list of all the upcoming Free Fishing dates.